Just like little kids at the fair, we love turtles. They’re armored, they’re scaly, and they take life slowly. However, the leatherback sea turtle takes turtleness to a different level. Down below the photic zone, a reptilian tank the size of a volkswagen beetle flies through the water eating jellyfish along its path. 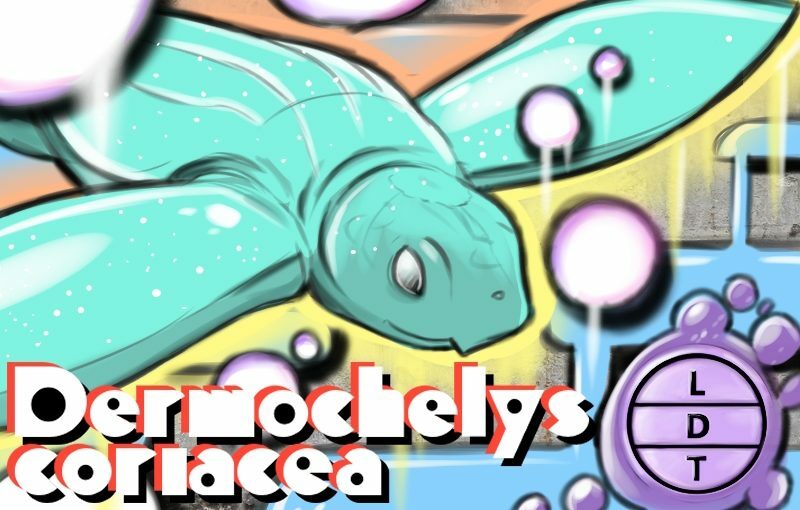 Since other turtles wouldn’t be able to survive at these depths, the leatherback can’t let the pressure take any skin off its back here in Life Death and Taxonomy. Leatherbacks are the largest species of sea turtle in the world. They have teardrop shaped bodies with large, powerful front flippers. Unlike pond turtles with webbed, clawed fingers, sea turtles have flattened limbs with no claws. This distinction, among others, shows how sea turtles are built for life at sea, and spend less time on land than fresh water turtles. Leatherbacks are grey or black with white splotches. Like many sea creatures, their colors are counter-shaded, which means they have lighter colors on their bottoms and darker colors on their tops. Leatherbacks can be found all over the world’s oceans, especially in temperate waters. They spend most of their time in the pelagic zone, which is the open ocean. But they can also be found close to beaches that have a short drop to deep water and avoid beaches with barriers like reefs and dunes. An individual can migrate thousands of miles each year while following prey. One study followed a turtle that travel 12,000 miles in 647 days. Leatherbacks like to eat squid, jellyfish, and other soft-bodied organisms that can be found floating around the open ocean. During the day they hunt in open waters and at night they move closer to shallow water, which is consistent with a jellyfish’s daily movement. One was seen actively hunting in water that was 0.4 °C. (32.72 °F). If you get eaten but a leatherback, you really have no hope of escaping. Their esophagus is covered in downward facing spines that help keep prey from swinging back out. However, if you’ve ever seen a cnidarian floating in the water, but they often look a heck of a lot like a clear plastic bag. Plastic debris that makes its way to the ocean can easily be mistaken for a tasty morsel for a sea turtle. Plus, their spiny esophaguses probably mean, once they swallow a bag, it stays swallowed. Plastic can become lodged in their digestive tract and kill them. It’s difficult climb out of the water and bask on a rock like other turtles when you live in the open ocean. As a cold blooded creature, they need to regulate their body temperature in another way. They are able to regulate their body temperature endothermically like the rubber boa. Researchers thought they might produce heat from resting metabolism like a mammal. But they found that there metabolic rate wasn’t significantly different from other reptiles. So they found that leatherback just don’t rest. They spend less than 0.1% of their days resting. Instead, they keep active all the time and generate heat from their muscles burning calories.